Print on a wide range of media. Print and scan documents PC-free. Improve your print, scan and copy speeds with this network-ready multifunction laser printer that features upgradable memory and a dual-core processor. Do more for your business and use less paper, thanks to built-in two-sided printing and the ability to print on diverse materials. Gain access to pre-installed workflow solutions via the vibrant, easy-to-use 10.2” color touch screen. Use the easily accessible front USB Direct print port to store scanned documents and print directly from a flash drive quickly and efficiently. Includes 160 GB hard disk, offset stacker, 100 sheet multipurpose feeder and two 550-sheet trays. 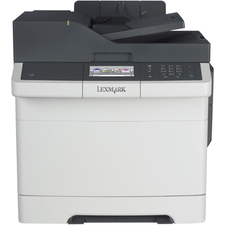 Machine Functions: Copy; Fax; Print; Scan; Printer Type: Laser; Maximum Print Speed (Black): 55 ppm; Network Ready: Yes.